Whether you’re planning a corporate outing, inspired client meeting, or just an enjoyable day of golf with friends, we pride ourselves on delivering flawlessly executed golf tournaments and outings for groups of up to 150 players. 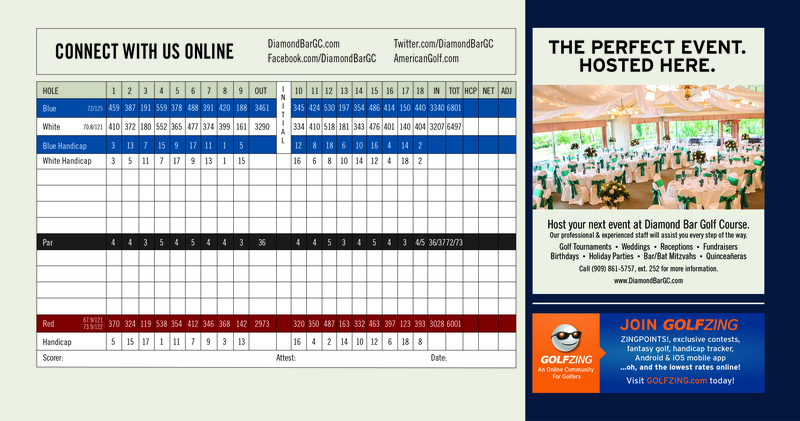 Diamond Bar Golf Course provides a dual ceremony and reception site, and with our picturesque golf course and customer service expertise, your tournament is sure to be a hit. Favorite quote or personal saying? "Dont' Worry, Be HAPPY"
Accommodate groups up to 150 players. Expert tournament consultation services and on-site event management. Service from a professional golf staff. Full use of practice facilities and driving range. Equipment rental for men and women. Optional tournament food packages and full-service onsite banquet facilities and catering service.